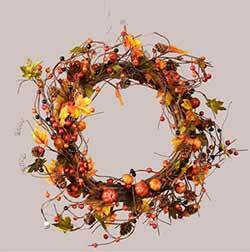 Fall Wall Decor - Canvas art prints, stitchery, plaques, and other wall decorations in fall and thanksgiving themes, such as pumpkins, fall leaves, scarecrows, and more! 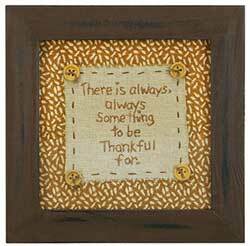 This country stitchery reads: There is always, always something to be thankful for." 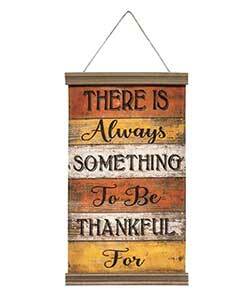 A Lisa Johnson design. 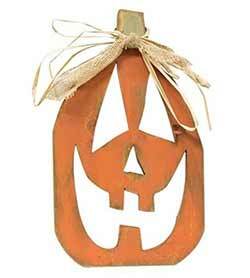 Beloved Lord Hanging Paddle, by The Hearthside Collection. A Michelle Kildow Design. 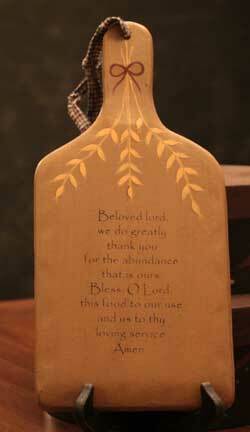 Features a painted prayer and golden vine on a tan wooden paddle with homespun fabric hanger. 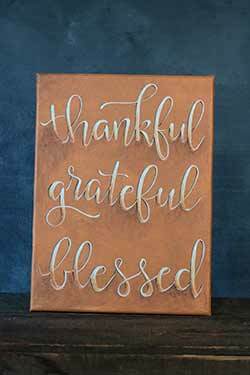 Reads: "Beloved Lord, we do greatly thank you for the abundance that is ours; Bless, O Lord, this food to our use, and us to they loving service; Amen." Measures 13.5 x 6.5 inches. 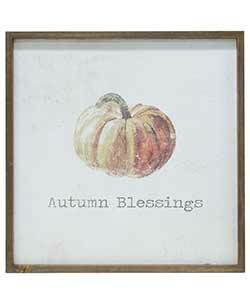 Made of hand-painted pressed wood, distressed and aged for a rustic look. 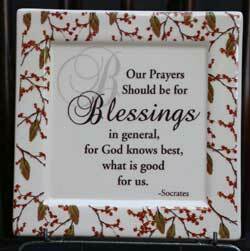 Bountiful Blessings Vintage Postcard Picture, by Primitives by Kathy. 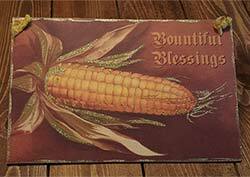 Wooden plaque featuring a vintage postcard image of an ear of corn, and reads: "Bountiful Blessings." 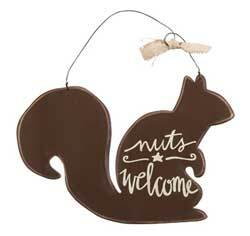 Accented with touches of glitter, with ribbon hanger. Measures 14 x 9 inches. 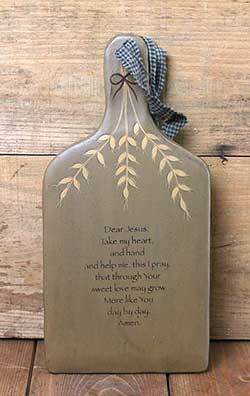 Dear Jesus Hanging Primitive Decor, by The Hearthside Collection. A Michelle Kildow Design. 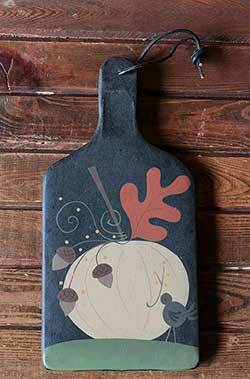 Features a painted prayer and golden vine on a tan wooden paddle with homespun fabric hanger. 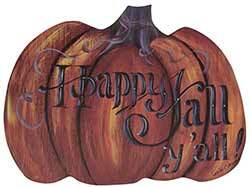 This thick, pressed wood cutout of a pumpkin featuring lettering that reads "Happy Fall Y'all!" 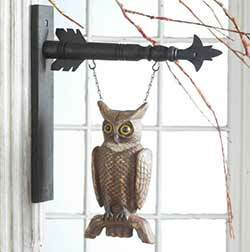 Hoot Owl, by Primitives by Kathy. 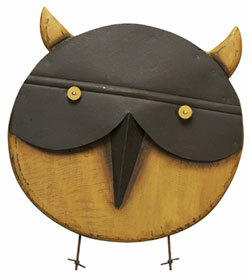 This wooden owl plaque wears a black metal mask! A Dan DiPaolo design. Measures 10.5 x 10 inches Wood and metal. 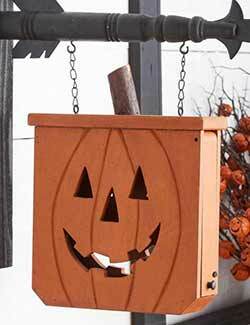 Roughly-cut wood in the shape of a Jack-O-Lantern with cut out grinning face. 18 inches. 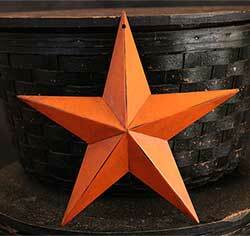 Wood slat pumpkin plaque features a primitive star accent with distressed edges and twigs for a dimensional look. 18 inches. 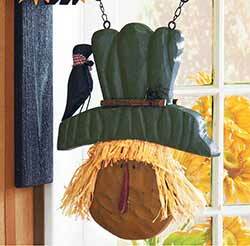 Masked Jack Hang-up, by Primitives by Kathy. 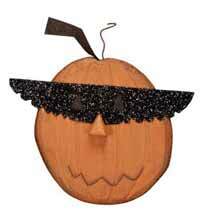 This wooden Jack O'Lantern plaque wears a black glitter mask! A Dan DiPaolo design. Measures 11 inches across. Wood and metal. 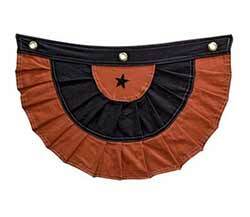 Orange Primitive Pumpkin Hanging Tray, a Michelle Kildow design for The Hearthside Collection. 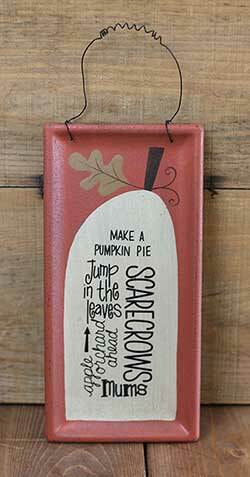 This painted and distressed hanging tray features a painted pumpkin and whimsical lettering list of fall "to-dos." 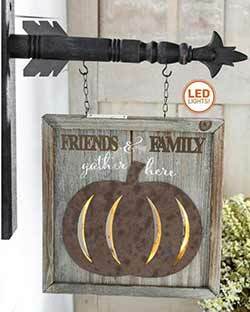 Greet friends and family this fall with a rustic pumpkin arrow replacement, painted a bittersweet orange color and accented with wooden leaves. Pumpkin is double sided. 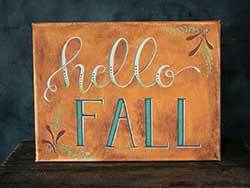 Hand painted on rustic reclaimed wood, this charming little sign is the perfect accent to your fall or summer festival, party, or outdoor display! 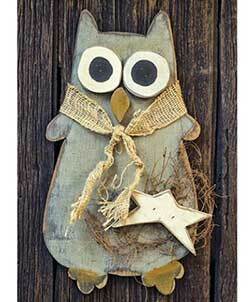 Great for your wall or front door, this primitive wall hanging is shaped like a quirky owl! 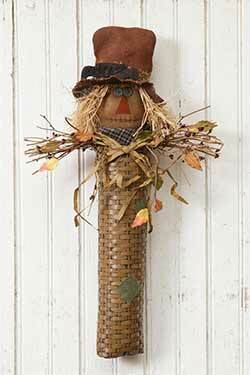 Made of old, rustic and distressed painted wood, with accents of twigs and jute. 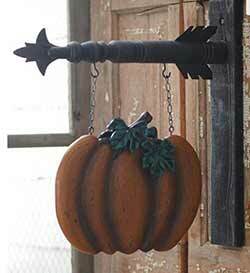 Features a painted design perfect for your primitive fall wall decor, with a white pumpkin, oak leaves, acorns, and a blackbird. 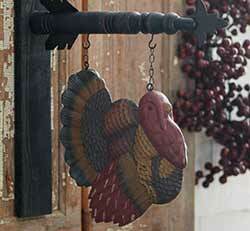 Give your home autumn charm this Thanksgiving with this colorful turkey arrow replacement! 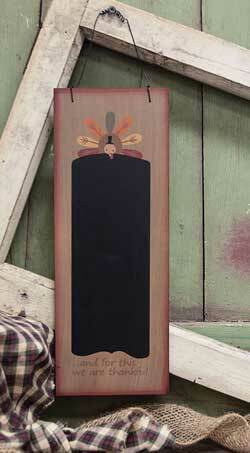 Turkey Hanging Chalkboard Sign, a Michelle Kildow design for The Hearthside Collection. 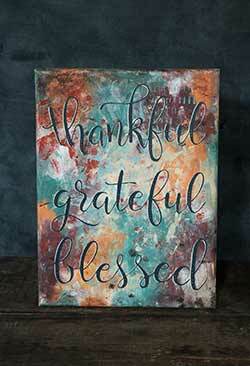 Painted and distressed plaque with chalkboard section for writing your own messages! 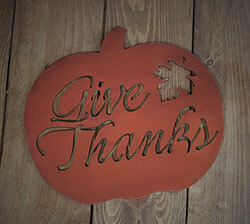 Features a painted turkey design. 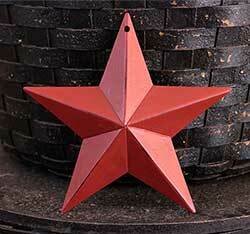 Measures 14 x 5 inches. 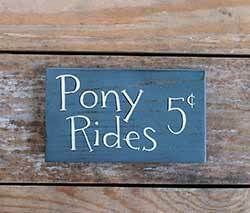 As with all Hearthside signs, this is rustic and distressed, adding to the individual charm. 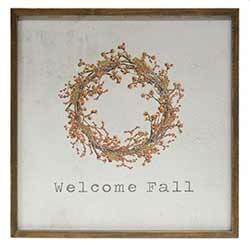 Sign displays a watercolor image of a bittersweet wreath, and reads: "Welcome Fall." Measures 20 x 20 inches.